Thomas Kipkemei Kiyai joined Consolidated Bank in April 2015. He has over 20 years of experience in banking and finance before he joined Consolidated Bank of Kenya from Kenya Commercial Bank, where he served as Director, Financial Planning and Control. He holds a Masters of Business Administration Degree in Corporate Finance from the University of Nairobi and a Bachelors of Commerce Degree in Accounting. In addition, he is also an alumni of the Oxford University Management & Leadership Development Programme. Thomas Kiyai is a member of the Institute of Certified Public Accountants of Kenya (ICPAK). George Kipkoech Rutto is a career banker with over 27 years’ experience. He joined Consolidated Bank in 2007. His stint in banking began at National Bank of Kenya where he started as a Management Trainee and rose to Manager, Audit. He later joined Credit Bank as Head of Internal Audit. He holds a Masters of Business Administration in Finance from the University of Nairobi and has a double major Bachelor’s Degree in Finance and Accounts from USIU-Nairobi. Additionally he is a Certified Public Accountant of Kenya (CPA-K) holder from Strathmore University. He has been awarded Certificates of Commendation and Fellowship by ICPAK in recognition of service to the accounting profession. George Rutto is also the Chairman, Board of Trustees of the USIU Alumni Association and a member of the Institute of Certified Public Accountants – Kenya (ICPAK), Kenya Institute of Management (KIM) and Institute of Internal Auditors. Jacinta Lwanga joined Consolidated Bank in 2013. She was previously at CMC Holdings Limited as the Group Human Resources Manager. She has undertaken consultancy work - focusing on HR and Communication in various organizations such as Church Ecumenical Action in Sudan, Institute of Personnel Management now Institute of HR Management and Kenya Human Rights Commission. She holds a Masters of Business Administration Degree from Africa Nazarene University – Nairobi and attained her Bachelor of Arts degree, Upper Second Class Honors from the Kenyatta University. She is a member of the Institute of Human Resources Management – IHRM (K) and member of the Institute of Directors (Kenya). Edward Nthuli joined Consolidated Bank in 2005 holding the position of Operations Rigour Manager and later Risk and Compliance Manager before taking up his current role. He has previously worked for Barclays Bank of Kenya as a Retail Manager, Premier Manager and a Business Manager. He holds a Bachelor’s degree in Commerce from University of Nairobi and has taken a host of courses in Audit, Risk and Governance as well as Financial Risk Management. Edward Nthuli is a Trustee of the Consolidated Bank Pension Scheme. Erastus Gachoya is a career banker with over 25 years’ experience. He joined Consolidated Bank in 2006 as a Corporate Relationship Manager. He has also held various managerial positions in other banks including African Banking Corporation (ABC), Diamond Trust Bank (DTB) and Kenya Commercial Bank (KCB). He holds a Masters of Business Administration degree in Strategic Management from the University of Nairobi. In addition he also holds a Bachelors of Arts degree in Business Education and Economics from Kenyatta University. Erastus Gachoya has also taken various courses on Leadership and Corporate Governance. Japheth Kisilu was appointed as the Chief Commercial Officer of Consolidated Bank in 2011 and has served the bank for 11 years when he began as the Chief Accountant. He was previously at Africa Media Group as the East Africa Region Finance Manager. He has also gained accounting experience from Price Waterhouse (Kampala and Nairobi) and Ernst & Young (London and Nairobi) in various managerial and supervisory positions. He holds a Masters of Business Administration degree in Strategic Management from Moi University, a Bachelor of Commerce degree (Accounting Option) from University of Nairobi and has attended numerous training courses in Management and Leadership. He is a Fellow of the Institute of Chartered Accountants in England and Wales (ICAEW) and a member of ICPAK. Joseph Njuguna joined Consolidated Bank in 2005 as the Manager, Internal audit before his appointment as Head of Finance and Administration. He has worked for Housing Finance as a Senior Internal Auditor and as a Section Head Internal Audit at CFC Bank Limited. He holds a Master of Business Administration degree in Strategic Management from the University of Nairobi. In addition, he has a Bachelor of Commerce degree (Accounting Option) Second Class Honors Upper Division from the University of Nairobi and has undertaken a Senior Managers’ Leadership Program from Strathmore Business School. 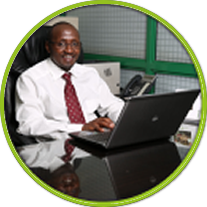 Joseph Njuguna is a Certified Public Accountant of Kenya (CPA-K) and a member of ICPAK. Josephine Mutunga joined Consolidated Bank in 2011 as the Head of Risk and Compliance before taking up her current role as Head of Retail and SME in 2014. She previously worked for GT Bank (Formerly Fina Bank) as Head of Risk and Compliance, at Sidian Bank (Formerly Krep Bank) as General Manager Enterprise Risk and at Prime Bank. She holds a Bachelor of Commerce degree (Accounting Option) with an Upper Class Honors from the University of Nairobi and a Diploma in Advanced Risk Management in Banking and Finance from Sweden. Josephine Mutunga additionally holds a Diploma in AKIB, is a Certified Public Accountant of Kenya (CPA-K) as well as a Certified Lead Auditor for QMS Systems. Joshua Kagia joined Consolidated Bank in 2005 as the Head of Treasury. He was previously at ABC Bank as the Treasury Manager and has also worked for Diamond Trust Bank as the Assistant Regional Treasury Manager. Joshua Kagia has also worked at NIC Bank as a Dealer for Forex and Local Money Markets. He holds an Executive Masters in Applied Leadership and Management and an Executive Bachelors of Business Administration degree (EBBM) from the Management University of Africa (MUA). He has also attained a Masters in Business Administration (International Business) from the Institute of Technology in Australia (IOTA). Additionally has a Diploma in Banking and has undertaken numerous courses in Banking and Treasury Management among others. He is a member of Financial Markets Association (ACI Kenyan Chapter) and Kenya Institute of Bankers. Martin Mmata joined Consolidated Bank in 2016 as the Head of ICT. Previously he worked at Harambee Sacco Society Limited as the Head of ICT. 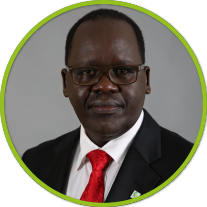 He has also worked for Old Mutual Kenya as the ICT and Infrastructure Manager and at Pan Africa Life Assurance as a Division Manager - ICT. He holds a Master of Business Administration degree (Strategic Management) from Africa Nazarene University. He also has a Bachelor in Information Sciences (Information Technology) from Moi University. He is a Certified Information Security Manager by ISACA (Information Systems Audit & Control Association) and Strathmore University. Martin Mmata was named the ICT Manager of the Year 2015, an award by the Information Communication and Technology Association of Kenya (ICTAK). He is a member of ISACA and the Information Sciences Alumni. Wakonyo Igeria joined Consolidated Bank in 2004 as the Legal officer before taking up her current role as the Head of Legal Services/ Company Secretary. She previously worked for Kenya Power & Lighting Company as a Legal Officer. Wakonyo Igeria has also worked for Wambugu & Company Advocates as an Associate. She holds a Bachelor of Law degree (2nd Class Honors) from the University of Dar-es-Salam and has attended a host of training courses in Credit Control, Total Quality Management and International Trade Finance among others. She is an appointed Commissioner for Oaths by the Hon Chief Justice of the High Court of Kenya and is admitted to the bar as an Advocate of the High Court of Kenya. She is a member of the Law Society of Kenya and the Christian Lawyers Fellowship. Jullie Oyuyo Odadi joined Consolidated Bank in November 2012 as the Manager Credit. She was later re-deployed to set up the Product Development and Innovations department. A position she held until she was appointed to act as the Head of Credit. She previously worked at Standard Chartered Bank and Housing Finance in various capacities. Jullie holds a Bachelor of Economics degree from Egerton University and also attended Strathmore University for the IMIS diploma course. She has also undertaken courses in Leadership, Banking, Credit Management, Product development and Customer Service.